5:30 pm: Traffic backed up on Kent Avenue; even the northbound cars are unsure where to go. Today, DOT implemented one-way traffic on Kent Avenue from Clymer north to Broadway. How did it go? As one Curbed commenter noted, not so great. Instead of diverting traffic from Kent over to Roebling, DOT just diverted traffic off of Kent, leaving everyone to fend for themselves once they got to Broadway. 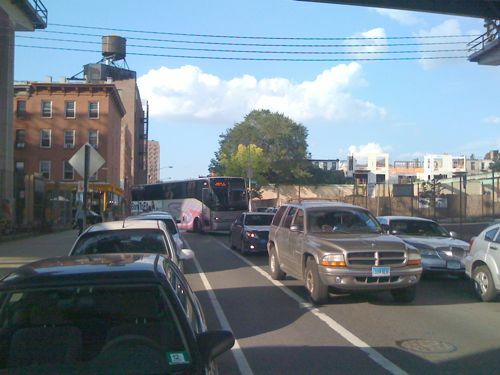 Which meant that most traffic tried to use Wythe – even the 18-wheelers, which are too big to make the turn off Broadway onto Wythe. When I passed by at 8:30 this morning, DOT had a flagman waving southbound off Kent and onto Broadway. 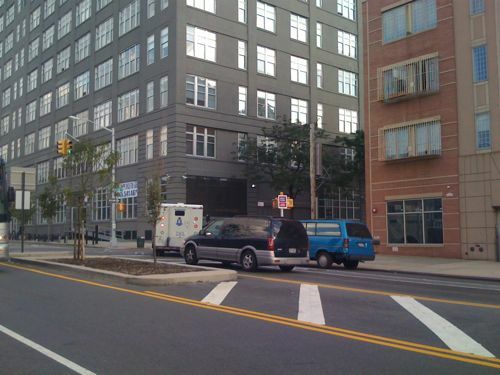 There was no one directing traffic away from Wythe, and no one enforcing the no truck rule on Wythe. There was an 18-wheeler trying to make the turn, which required much backing up of the truck and hence much backing up of traffic on Broadway. This evening, just before 5:30, the situation was even worse. The flagman was gone, creating a free-for-all at Kent and Broadway. Southbound traffic (cars and trucks) was backed up past the bridge on both Kent and Wythe. Trucks and buses were using Wythe, and using side streets to get from Kent to Wythe. Most of the traffic turning onto Broadway from Kent (including all of the trucks and school buses) quickly made a right onto Wythe. So knowing that they were dealing with a hot-button issue and making a major to traffic patterns in North Brooklyn, DOT’s traffic-management solution is a flagman (who probably knocked off at 3:00) and a couple of no-left-turn signs. No traffic agents to direct traffic. No police officers to issue warnings to trucks going off the designated truck routes. 1. Divert through traffic (truck and otherwise) away from the Franklin/Kent route. 2. Enforce the existing truck route regulations (and for the next few weeks, take some traffic agents off ticket-writing duty and put them on traffic-control duty). 4. 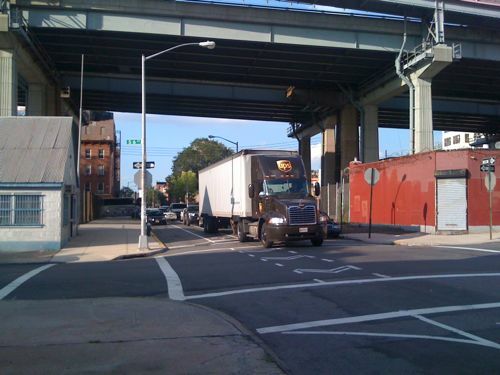 Install traffic signals and traffic-calming measures along Wythe Avenue to discourage trucks and through traffic. 5. Conduct a district-wide transportation study to determine the impact that thousands of new residents, the loss of hundreds of manufacturing establishments, the installation of a greenway on Kent Avenue and the conversion of large swaths of the waterfront to destination parks has on the transportation needs of North Brooklyn. Okay, this should have been #1. And it should have been done in 2004, not 2009.
also backed up traffic coming eastbound to turn onto Wythe (such as the B61). 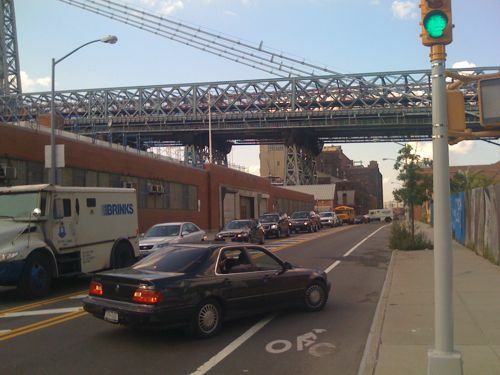 Traffic on Wythe was also backed up past the bridge, with a large number of (illegal) trucks. bottleneck at Kent and Broadway.